How can we improve food access in Elkhart County by strengthening connections between local farms, institutions, and charitable food networks? Join us for a community conversation focused on systemic issues embedded in our food system and opportunities for lasting change. 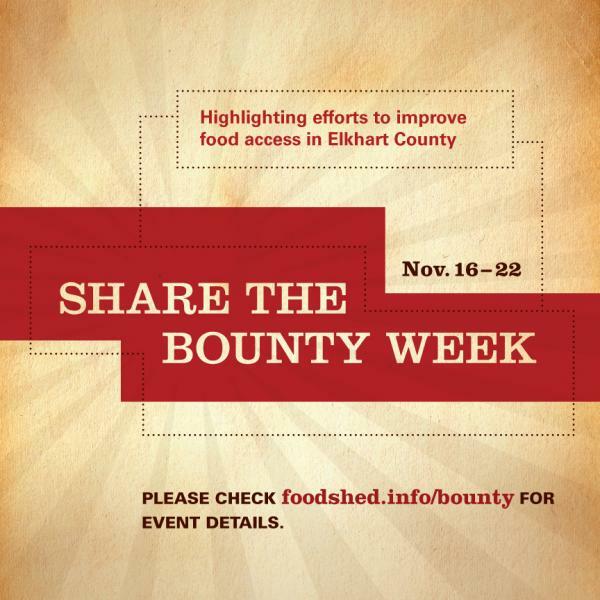 Doors will open at 1:30 for an exhibit of Elkhart County Food Security Highlights. A welcome at 2pm will be followed by talks by Adrianne Penner of the Boys and Girls Club of Goshen and Rod Roberson of Church Community Services﻿. Adrianne will share about the Club's efforts to enhance food access, improve food literacy, and promote healthy food and lifestyles at the Club and at home. Rod will introduce the connections growing through the work of Seed to Feed, Men Alive, and other Church Community Services programs. He'll also set the stage for a a World Cafe Conversation about food security and food access in Elkhart County. The event is free and open to the public, at River Oaks Community Church, 58020 County Road 115, Goshen, IN. Please RSVP (form below) if you can join us. We will need help setting up, tearing down, setting out snacks, and potentially watching a few kids. We are hoping to provide child care if we can find enough volunteers to pull it off. Please contact Natasha Weisenbeckat nweisenbeck@churchcommunityservices.org or (574) 295-3673 ext 122 to volunteer!